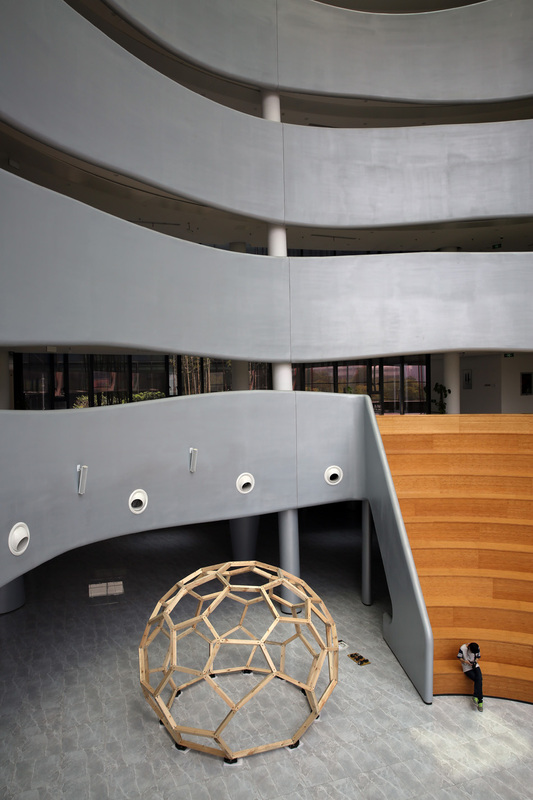 The ‘mero’ pine sphere in ZDICP Nanjing is the first constructed instance among the mero class. Each member of the mero class is parameterized, furthermore, all components of any mero installation are geometrically unique. Thus, the mero pavilion is similar to natural organism within which the form is differentiated anywhere. 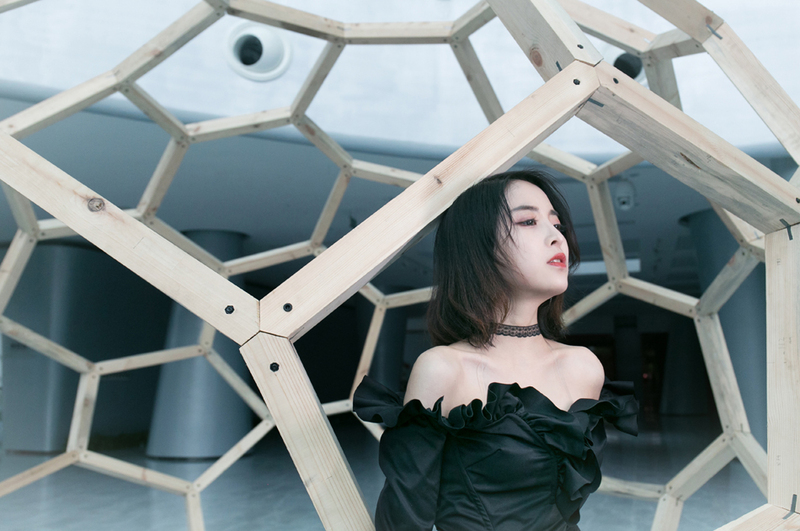 Contrast to industrial uniform products, the individualized mero pavilion cannot be reasonably fabricated without new-generation robotic technology (Industry 4.0). Timber is the only 100% renewable building material. Thanks to the cellular micro structure, wood is strong and light. Chinese traditional wood architecture features Sun-Mao, a rich family of sophisticated mortise-tenon connections. 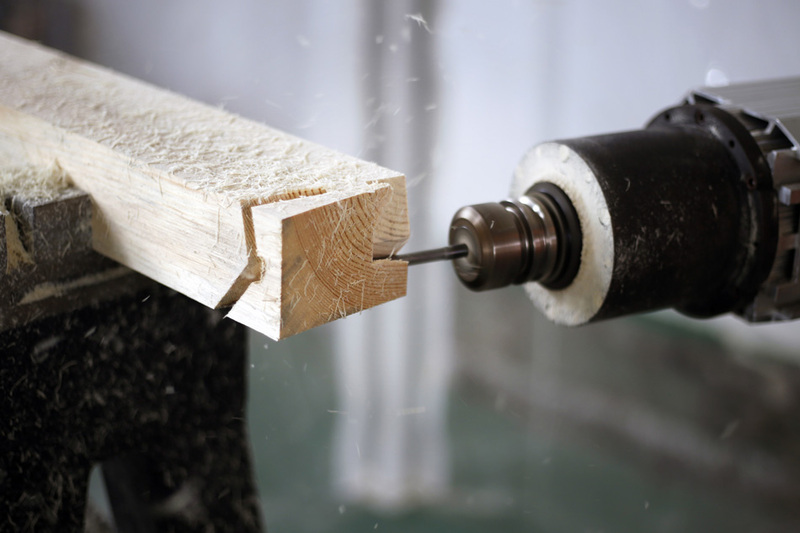 The Mao (mortise) is a cavity cut into the wood to receive a Sun (tenon), as a practical application of the ancient Yin and Yang philosophy. The mero pavilion develops a new Sun-Mao strategy: the planar steel piece as tenon and the narrow cuts in the timber as mortise. 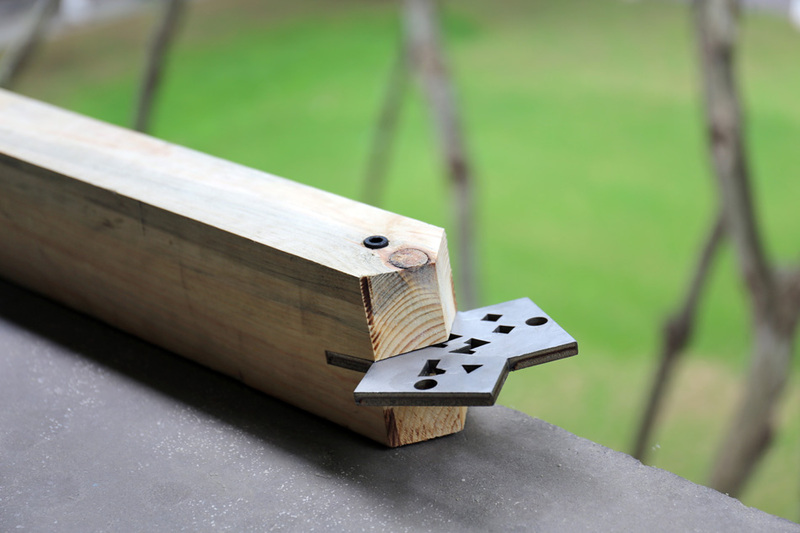 One steel piece joins three timber bars together. The pavilion mainly bears compression, thus each bar bears axial force with low buckling risks. Next-generation manufacturing features customization and component-driven processing. 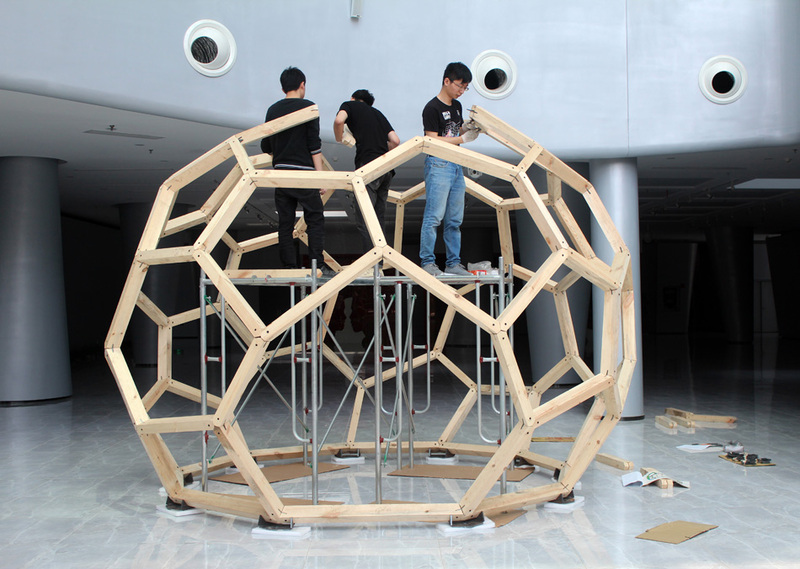 The pine sphere consists of 114 wood bars fabricated by robots and 76 steel panels out of laser cutter. The shape of each component is unique, which renders the technology of mass production obsolete. So a bespoke fabrication process is programmed. 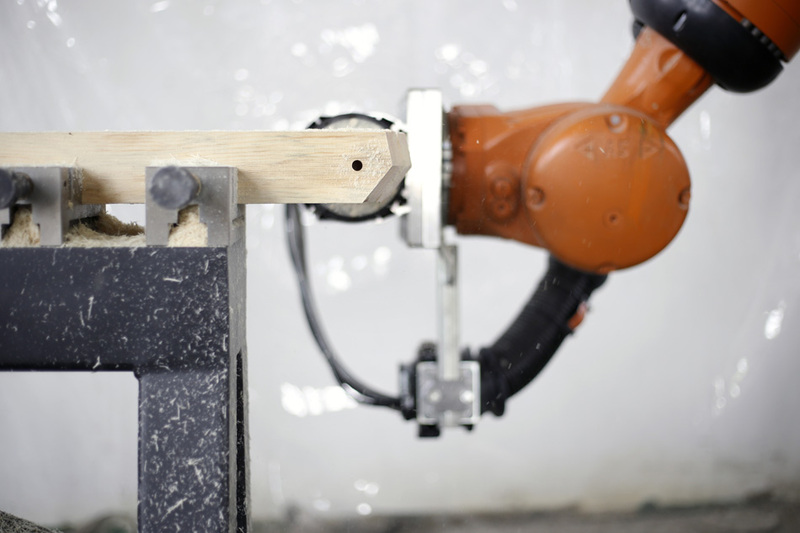 The mero project chose KUKA KR210, a high payload 6-aixs robot, to work with a HSD spindle. The robot and the spindle’s automatic tool change (ATC) enable the robotic system to cut, mill, and drill the wood in various ways. Based on the general purpose language Java, the project employed the javakuka open-source library to program the robot’s toolpath. Thus, the entire workflow from product design to toolpath palling involves no CAD/CAM software. The mero project re-constructed the traditional sequence of “design – tests – production” with computational methods. Based on computational geometry and CNC programming techniques, we developed a mathematical model to represent both the form-finding and the fabrication of the timber sphere. Our Java program does not only articulate the pavilion’s shape but also create the fabrication data for machines (laser cutter and KUKA robot). With this shortcut digital flow from design to manufacturing, the high-level parameters of the pavilion (e.g., the amount of bars) are mapped to the data in the machine instructions. May 9, 2018 | Filed under Others.